OK … so waaaaay back in September last year, I did a FaceLip-off between Lime Crime Velvetines and the OCC Lip Tars. You can read about it here. In that particular Clash of the Titans, the Lime Crime Velvetine emerged as the firm favourite. So here I am, ten months later, pitting my old favourite Lime Crime Red Velvet Velvetine against a heavyweight newcomer; Jeffree Star’s Velour Liquid Lipstick in Redrum. On the left – a (slightly filtered!) 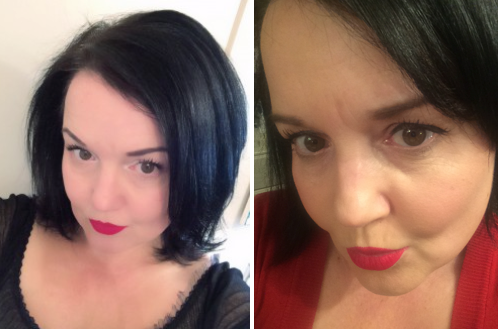 version of Mumpty wearing Lime Crime Velvetine in Red Velvet and on the right; a duck-faced version of Mumpty wearing Jeffree Star’s Velour Liquid Lipstick in Redrum. The reasons for the Velvetine’s fall from grace? 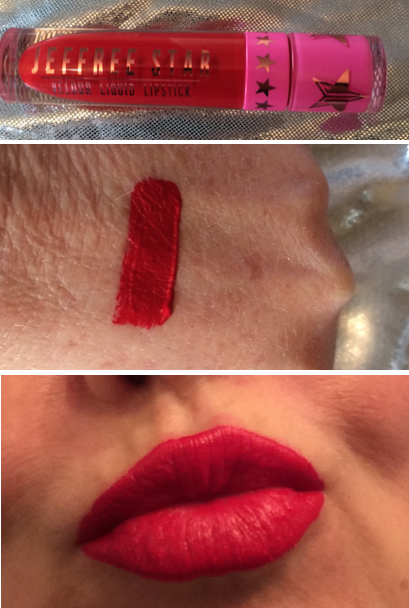 ♥ Jeffree’s version is a brighter, more vibrant, truer red. Having said that, the Red Velvet is gorgeous too; I just found the new formula slightly darker than the original and I liked the original more. ♥ The formula is easier to use. It has a veerrrrry slightly waxy feel to it and the applicator is just that little bit better. It delivers more product and is just a wee bit easier to fix any little mistakes you may have made before it dries – and with a colour as bright as this one, you need a bit of wiggle room! ♥ It’s not as drying as the Velvetine. It doesn’t leave your lips parched to all hell after five minutes and the formula doesn’t “ball” like the Velvetine can sometimes do. ♥ IT.BLOODY.WELL.STAYS.ON – like, seriously! You ‘aint getting that baby off without some effort! Meaning, that Mumpty’s Red Lipstick Survival Kit may not be necessary with this one. ♥ It’s just MORE LUSH, MORE BETTERER and MORE SUPERIOR! I guess it also doesn’t hurt that it’s 100% cruelty free, vegan, paraben free and gluten free. Swatchy, swatchy! Yes, I am aware I went a bit over the edges and my lips are a bit wonky – but I did it for you guys! So there you have it; as much as I have loved the Lime Crime Velvetine, I’ve simply had to slide it to the back of my makeup storage in favour of Jeffree’s offering. 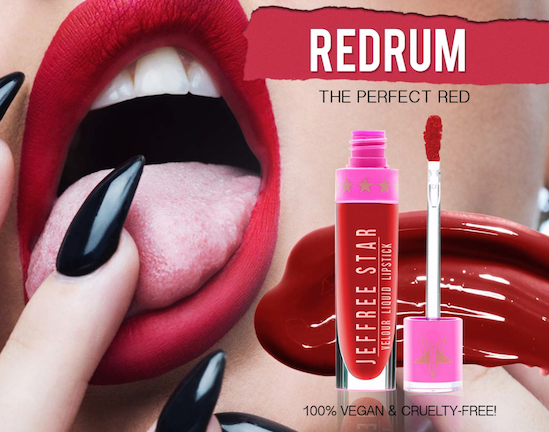 Posted on July 17, 2015 September 23, 2018 by MumptyStylePosted in Makeup/Skincare, Mumpty ReviewsTagged Jeffree Star, Jeffree Star Cosmetics, lime crime, lipstick, liquid lipstick, Obsessive Compulsive Cosmetics, OCC, pinup, red lipstick, Red Velvet, Redrum, Velour liquid lipstick, Velvetines. Looks so lovely on you! It looks a little bright for me…I find blood red lippies look the best on me but wouldn’t mind trying it out! I’m obsessed with lipsticks!!! hahaha!! !